Dyeing is the process of imparting colors to a textile material through a dye (colour). Dyes are obtained from flowers, nuts, berries and other forms of vegetables and plants as well as from animal and mineral sources. These are known as natural dyes. The other class of dyes is known as synthetic dyes. These are based on a particular type of chemical composition. Some of these dyes are- Acid ( Anionic) dyes, Basic ( Cationic) dyes, Neutral- Premetalized dyes, sulfur dyes, vat dyes, reactive dyes, pigment dyes etc. Colour is applied to fabric by different methods of dyeing for different types of fiber and at different stages of the textile production process. These methods include Direct dyeing; Stock dyeing; Top dyeing; Yarn dyeing; Piece dyeing; Solution pigmenting or dope dyeing; Garment dyeing etc. Of these Direct dyeing and Yarn Dyeing methods are the most popular ones. When a dye is applied directly to the fabric without the aid of an affixing agent, it is called direct dyeing. In this method the dyestuff is either fermented (for natural dye) or chemically reduced ( for synthetic vat and sulfur dyes) before being applied. 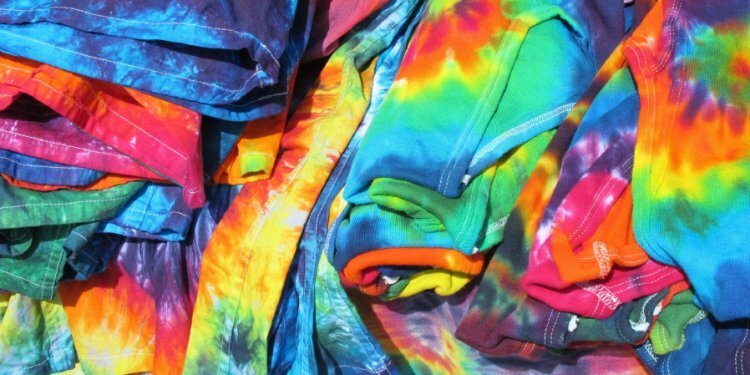 The direct dyes, which are largely used for dyeing cotton, are water soluble and can be applied directly to the fiber from an aqueous solution. Most other classes of synthetic dye, other than vat and sulfur dyes, are also applied in this way. When dyeing is done after the fiber has been spun into yarn, it is called Yarn dyeing. There are many forms of yarn dyeing- Skein (Hank) Dyeing, Package Dyeing, Warp-beam Dyeing, and Space Dyeing. The yarns are loosely arranged in skeins or hanks. These are then hung over a rung and immersed in a dyebath in a large container. In this method, the colour penetration is the best and the yarns retain a softer, loftier feel. The yarns are wound on spools, cones or similar units and these packages of yarn are stacked on perforated rods in a rack and then immersed in a tank. In the tank, the dye is forced outward from the rods under pressure through the spools and then back to the packages towards the center to penetrate the entire yarn as thoroughly as possible. It is similar to package dyeing but more economical. Here, yarn is wound on to a perforated warp beam, immersed in a tank and dyed under pressure. In this method, the yarn is dyed at intervals along its length. For these two procedures- knit- deknit method and OPI Space-Dye Applicator- are adopted. In the first method, the yarn is knitted on either a circular or flat-bed knitting machine and the knitted cloth is then dyed and subsequently it is deknitted. Since the dye does not readily penetrate the areas of the yarn where it crosses itself, alternated dyed and undyed spaces appear. The OPI Space-Dye Applicator technique produces multi coloured space- dyed yarns. The yarns are dyed intermittently as they run at high speeds of upto 1000 yards (900 m) per minute through spaced dyebaths with continuous subjection to shock waves produced by compressed air assuming supersonic velocities.